L: 49" x W: 2.5" x H: 49"
49" Decorative Large Wall Clock If you're looking for an accent piece that'll really draw attention, you've found it with this 49" decorative large wall clock. It's simple yet stunning with its aged black, wrought-iron frame with applied antique gold numerals and open fret-cut, diamond-style hour and minute hands. If you're looking for an accent piece that'll really draw attention, you've found it with this 49" decorative large wall clock. It's simple yet stunning with its aged black, wrought-iron frame with applied antique gold numerals and open fret-cut, diamond-style hour and minute hands. Went to R &amp; F to look for dinette sets. Didnt get a dinette, but while shopping in the store saw this clock. It is HUGE and beautiful. Was a lil over budget, so just kept it in mind. The next day I couldnt stop thinking about the clock, so I went to the R &amp; F website and I was soooooo happy to see it was on sale for 25% off and FREE FedEx shipping. Bought it and havent looked back. Got it in 2 days! The picture doesnt do it any justice at all. Its amazzzzing. This clock is absolutely all that it states .what impressed me most was the fact that the hands were already affixed to part of the clock ,and once completely assembled ( which was super easy ) the hands kept up pace ,every hour on the hour . I did not have to keep readjusting the hands , nor did the hands keep dropping suddenly when they reached 11:00, 12:00 or 1:00 o'clock . As you might guess ,I'm comparing this beautiful, sleek clock to a cheap "knock off " rendition I purchased on line a few months earlier , and ended up tossing it due to those annoying and frustrating problems . Yes it was WAY cheaper , but in all FAIRness it was no comparison to this Howard Miller clock . Friends and family are impressed when they walk into my living room to be greeted by this statement piece hanging on my wall. It's always a topic of conversation . Most importantly it's always on time .. With no assistance from me. Would I recommend it ? Yes ! this clock is a statement piece. it is beautiful and is one of a kind time keeper. Beautiful clock! Huge! Perfect for a Great Room or any room with a large empty wall. Looks awesome! 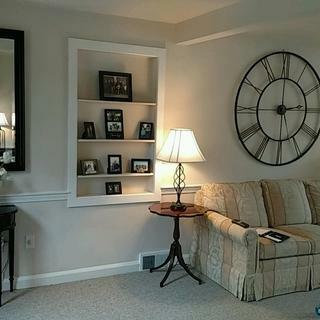 The clock was easy to assemble and hang and keeps great time. The icing on the cake was that it was on sale too! Clock looks just as beautiful on the wall as we xpected, love it! 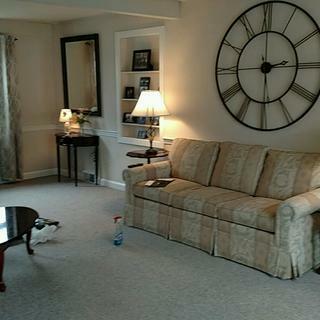 The 49” wall clock adds visual interest and balance to a great room which looked bottom heavy before. A “bang for the buck” option! Wall clock and all furniture (except chair & ottomans) from Raymour. Almost perfect, thanks?? 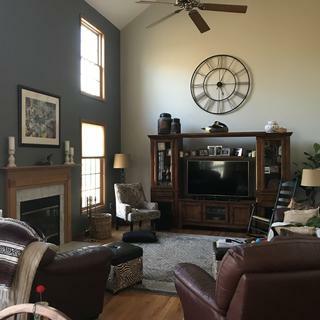 My clock is what I was looking for on my big wall space. It complements my living room and my decor. where is the hole to hang the clock and do you need a Molly since it is heavy? BEST ANSWER: The hole is on the very top of the frame of the clock. It is heavy so my contractor did use a special hook to hang it. But I don't know the name/type of hook. I have to say it looks great and I am happy I purchaed it. There is a metal rod probably made of iron on the back of the uppermost part of the circle. It has a peak in the middle to center your hook. To hang it I used an Ook 55099 Heavy-Duty Drywall Hanger. If you are hanging on drywall, this hanger is the best bar none. It takes two minutes to install and is capable of supporting 200 lbs. the hook is available on Amazon, but half the Amazon price at Home Depot. Hi Molly. I believe you will find two holes in the back. I’m sure my contractor would not approve of this answer, but I did not use a Molly or an anchor and I didn’t have any problems. The clock has a mounting bracket at the top just above the XII. The clock is heavy, so you will need a molly, or screw directly into a stud. The hole/opening is at the very top at 12 noon. I was able to use a thicker screw/nail with no molly. When will you have a sale on your wall decor? BEST ANSWER: We do have sales and very often. For details on upcoming promotions, please call 866-383-4484, option 3.
what is the weight of the clock? and how is it hung? BEST ANSWER: Your local Home Improvement should be able to recommend hardware to mount the clock; it is not included with the purchase of the clock. The item weight is 23 lbs, so you will need to make sure the hardware is sufficient to support that weight. THE ROMAN NUMBER 4 IS WRONG! CAN YOU FIX THIS ? BEST ANSWER: The manufacturer, Howard Miller Clock, uses IIII rather than IV as the original roman numeral 4 was IIII. This is the only way the clock is made. When was IV ever IIII? Never. Is the battery compartment readily accessible? BEST ANSWER: The battery compartment is located behind the center of the clock. The clock would need to be taken off of the wall to replace the batteries. is the diameter of the clock 49"? or 49" height at tallest point and 49" width at longest point? BEST ANSWER: Yes, it is 46" in diameter. If it's 46" round, then why is it advertised as a 49" clock? Does the downtown Brooklyn store have the clock in stock? BEST ANSWER: Our stores have items on display for viewing only. The Downtown Brooklyn store does have this on display. You may purchase it online, and it will get shipped directly to your home for free. Several people have commented that the clock keeps time well and that they don't have to do anything. Does that mean that it adjusts itself for daylight savings time? BEST ANSWER: No, the clock does not adjust itself for daylight savings time. What is the exact hardware you used to hang this clock? BEST ANSWER: Your local Home Improvement should be able to recommend hardware to mount the clock; it is not included with the purchase of the clock. The item weight is 22 lbs, so you will need to make sure the hardware is sufficient to support that weight. I read in one of the reviews that the clock had to be partially assembled, what needs to be assembled by the buyer on this clock? BEST ANSWER: In order to ship, it is boxed, with the two halves of the circle separated. One side has a 3" insert that goes into the other opening. It is very easy to assemble with no parts or tools needed. this clock does not come with mounting hardware. How did you hang it up. BEST ANSWER: The mounting hardware is not included with this clock. The clock does weigh 22 lbs, so you will just need hardware to properly support the weight of the clock. Is the clock loud? Can you hear ticking? BEST ANSWER: Yes you can hear the clock ticking, but it is not loud. How does one hang this clock? Is any special hanging hardware provided or needed? BEST ANSWER: This clock weighs 22 lbs.